By 1937 several of FDR's New Deal legislation including the Agricultural Adjustment Act and the National Recovery Act had been ruled unconstitutional by the more conservative members of the Supreme Court. In frustration, FDR proposed a plan in which he could appoint an additional Supreme Court justice for each justice that did not retire by the age of 70 1/2. The plan would allow him to appoint up to 5 additional justices. This plan was a huge political mistake for FDR and ultimately not needed. Why did FDR launch his attack on the Supreme Court in 1937 and why did it fail? Use the primary and secondary sources to write an essay that addresses the following: Why did FDR launch his attack on the Supreme Court in 1937 and why did it fail?. Your essay should be in the following format: Paragraph 1: Introduction paragraph Paragraph 2: What was Franklin D. Roosevelt's packing plan? Paragraph 3: How did FDR justify his plan? Paragraph 4: What was public and political reaction to the plan? Paragraph 5: How would this have affect the principle of checks and balances? Paragraph 6: Conclusion You need to use evidence from at least 3 primary sources. Turn a link to your finished essay into Canvas. 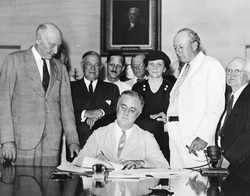 "Signing Of The Social Security Act" by Social Security Online - This image is available from the United States Library of Congress's Prints and Photographs division under the digital ID cph.3c23278. July 22, 1937, Washington (D.C.) Herald, " Republicans Enjoy It, Anyhow"
February 9, 1937, Brooklyn Citizen, "He Just Ain't Fast Enough"